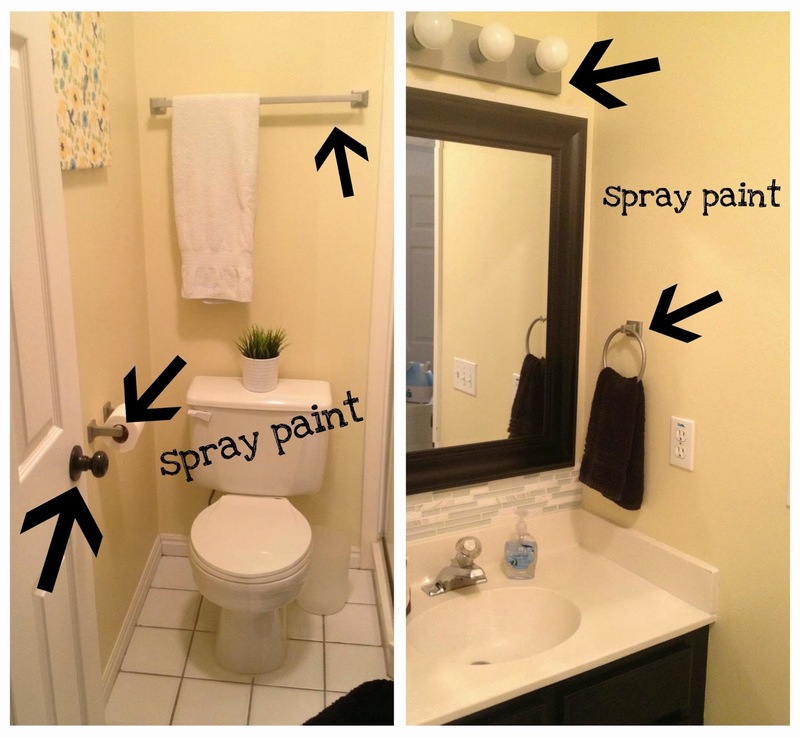 two points for honesty: jillian's bathroom makeover-finally! The completion of this project has been a REALLY long time coming. I'll get to the "why" of that soon. A few months ago I decided to go on a painting rampage and paint ALL of the cabinets in my house, which were previously a golden oak color- not my favorite. If you've ever done home improvement projects, you probably know things like this tend to domino...where if you're doing one thing, you might as well do another, and then you might as well completely redo the WHOLE space. ...or is that just me? Regardless, that's what happened (happens I should say...happenING right now in another room). I didn't want to spend a ton of money on this bathroom, since it's really only used for Jillian to go to the bathroom and brush her teeth, and occasionally for extra shower space when my family stays with us. It just needed a freshening of sorts, and no golden oak cabinets. 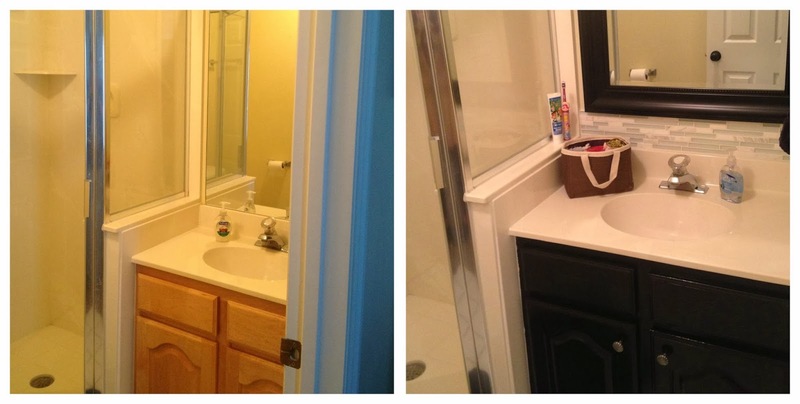 So first I painted the cabinets to match the other newly painted bathroom cabinets in the house and added knobs. Not super time consuming since these were so small (note, if you're taking on 3 bathrooms at once like I did, it actually is really time consuming and you'll hate your life until it's over). Rust-Oleum makes INCREDIBLE metallic-finish spray paint. 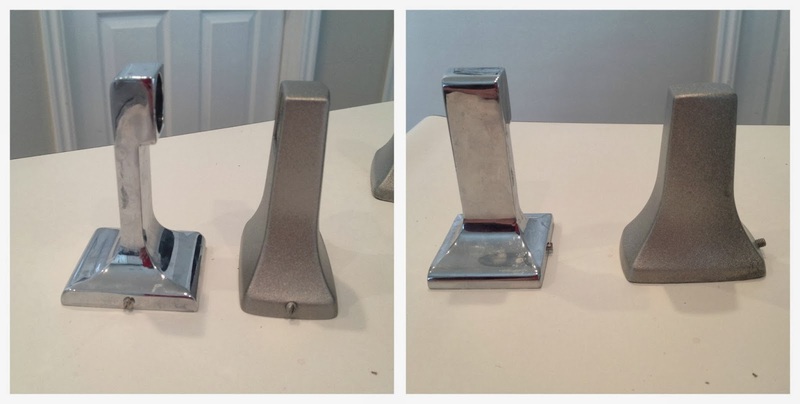 I used Satin Nickel on the previously chrome fixtures. Buying new bathroom accessories can add up really quickly. So if they're still functional but just an ugly color, spray paint them!!! When we moved in I started buying new door knobs to upgrade from the previous gold ones. Those suckers are expensive! I was getting the cheap ones at $23 a pop (the ones with locks were like $27). Since I discovered the Rust-Oleum oil-rubbed bronze spray paint, I haven't purchased a new door knob, just painted the old ones. And they look brand new. (Also a different knob in the before/after...apparently I can't take pictures of the EXACT same thing). It's SUPER easy to do. Just remove the old one, take a fine grit sandpaper to it to rough it up a little bit (doesn't have to be a lot), wash and dry it, then paint! The metallic spray paints come out much thicker than normal spray paint, so to avoid clumping and drips, keep your distance while you're spraying and do 2-3 light coats until the whole thing is covered, instead of worrying about complete coverage the first time you spray it. Let it dry for 2 days before you reinstall and use it. Mine have held up GREAT. It even works for knobs with locks- the spray paint didn't mess up the locks in the least. I would have spent $150+ on new fixtures for this bathroom (including a light fixture), but instead I bought a $7 can of spray paint. Score. So then I wanted to stay on the DIY train and build a frame to mount on the mirror. 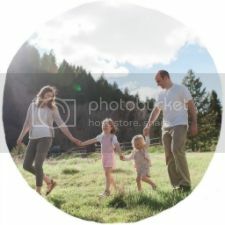 I was super excited the whole frame cost about $15 to make using mdf molding and paint (like this). When I attached it to the mirror, I noticed the whole mirror was a little lose from the wall. I went to the basement to get some liquid nails to remedy that little problem, got back into the bathroom, turned around for TWO SECONDS, and then....CRASH. 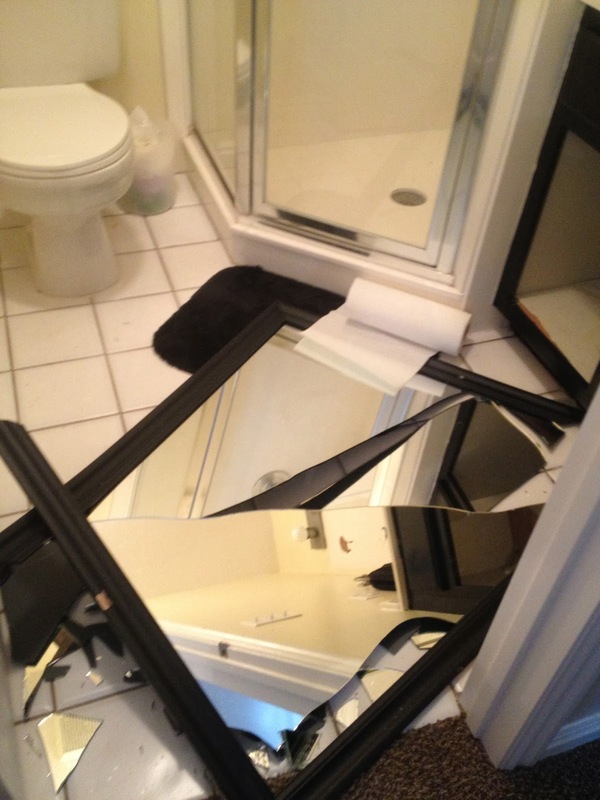 Not only did my newly built frame break, but the entire mirror. So my $15 mirror frame project turned into, "now I have to buy a whole new freaking mirror" project. Hence why the bathroom took so long to finish. I couldn't walk in there without wanting to curse for several weeks. And then I left it without a mirror for several more weeks as the hunt to find one close to the dimensions I needed failed time and time again. 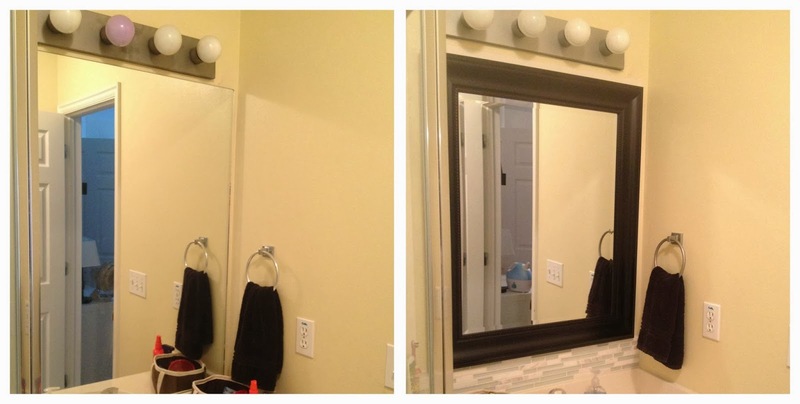 I finally found a mirror at Home Depot for around $70 I think- not bad. Not $15, but still not bad. As a last minute project I used leftover kitchen back splash to fill in the space between the sink and mirror. All-in-all I'm glad the mirror broke and I found a slightly smaller one so I could add this fun detail (even though I still cringe every time I look at that picture of the broken mirror everywhere). The color on the walls isn't my favorite, and there is a gap by the light fixture where you can see two layers of previous paint, so it will need to be repainted one day. But that day won't be soon, because like I said, we hardly ever use this bathroom and I have more important projects I want to move on to. It's my way of getting back at the walls for dropping my mirror. Take THAT walls. The art on the wall was also a last minute, 5 minute, project. I found some old fabric I had and stapled it to an old canvas I forgot I had in my basement. Done and done. Cabinets: I spread the paint over 3 bathrooms, so we'll say like $15 for these. The knobs were freebies from my mom's old cabinets. Mirror: $70...but really should have been $15. Seriously!! Can't beat that. 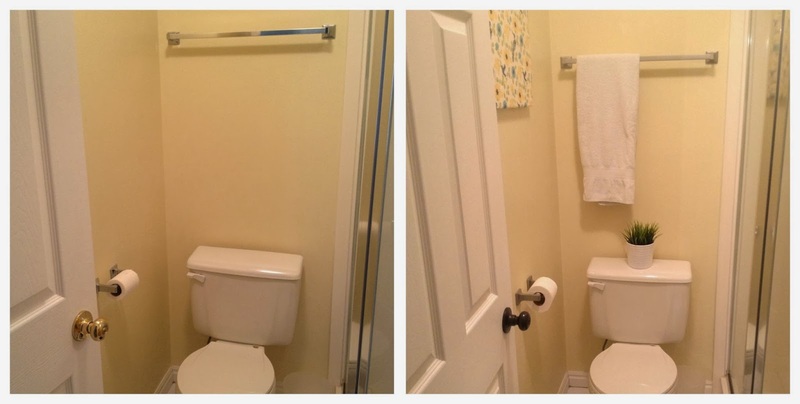 Small price to pay for a BIG difference in this little bathroom! And now I'm on to the project I've been wanting to tackle for months- our master bathroom! As long as we have no major mirror incidents, it should be done in the next month or so. 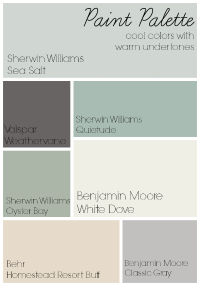 I've got fun things in store for that one...paint samples are currently up and waiting to be decided on- eek!